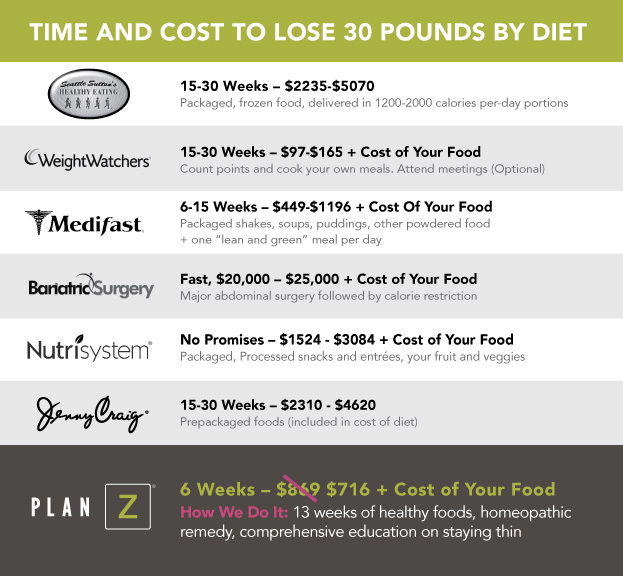 HOW MUCH DOES THE PLAN Z DIET COST? The Plan Z Diet costs $869 $716 for the 3-1/2 month program. You will save an additional $69 if you pay in full which will bring the price down to $647. Your Plan Z membership includes the four phases, the Plan Z manual which walks you through the program day by day, the ZR50 Crave Control spray, access to the Plan Z recipe and blog site, daily coaching emails, and the support of the Plan Z staff and coaches. Plan Z costs a fraction of what it costs to be overweight. Health economists for the Centers for Disease Control say that obesity costs overweight people an additional $1470 per year in increased medical bills and medication costs. Losing weight can actually save you money and aggravation. We have done a side by side comparison of some of the most popular diets. The information in our comparison chart below comes right from their ads and websites. There is no comparison when it comes to the speed at which the weight comes off on Plan Z. No other diet gives you the structure that makes this a plan for life and not just another diet. You can split the cost into 4 payments to make it easier on your budget. When you order a Plan Z membership, you will be charged your first payment at checkout. We’ll send your materials so you can start losing right away. You’ll pay the rest over the next three months. Want to save 25%? Pay in full and pay just $647. If you have more weight to lose after your first round, you have the option of joining ZClub. ZClub is only for returning Plan Z dieters and costs $19/month. ZClub members have access to the Plan Z site, the recipes, 2nd Tuesday calls, coaching, AND you can buy spray as you need it for $49 a bottle. ZClub not only makes it more flexible and affordable if you have a lot of weight to lose, but it also allows us to continue to provide you with recipes, education and the information you need to help you stay focused amid all the food traps that bombard us every day. And if you veer off track, you can get the spray you need to maintain your results without breaking the bank. We want to be here to support you all the way through your weight loss goals, getting you to a healthy weight you can live with. ZClub is only available to Plan Z participants who have previously participated in the diet at the full price or at the Buddy System price. We recommend people come to us with one round in mind because after that round is over, you’ll be happy to pay for the next one. You’ll see the value. Please give us 3 business days to process your order. All orders ship from Zola Headquarters in Chicago, IL via USPS. Of course, shipping times vary by location, but most orders in the continental US will arrive within a week of when they are shipped. Need to ship to another country? Call our office at 800-255-9853 for international pricing and ship times. Yes! All transactions on our website are ssl encrypted for your protection. You can also call one of our customer service representatives at 1-800-255-9853 if you would prefer to place your order over the phone, or if you have questions about Plan Z. Is Plan Z covered by insurance? My friend wants to lose weight with me. Can we save money? Yes! Take advantage of our Buddy System. When two or more people register together for Plan Z, each person pays $597. You can have as many Buddies as you’d like. Everyone shares in the savings. You don’t have to live in the same house, or even in the same city. This offer is only available by phone, so call us for details at 1-800-255-9853. You say the education is at least 60% of the value of Plan Z. What kinds of things will I learn on the program? You have to unlearn the bad diet advice you’ve been fed for years. Our so-called “obesity epidemic” in the USA is only about thirty years old. We started to fatten up in the early 1980s shortly after the U.S. Senate passed its Dietary Guidelines for America (1977). The government advised us to reduce our fat consumption from 40% to 30% and replace the fat with carbohydrates. Food companies jumped in and started making low fat, “diet” foods filled with enough sugar and high fructose corn syrup to make them palatable. We know that sugar is a main contributor to obesity in America but food manufacturers have not backed off on using varying forms of sugar in their recipes. When we got fatter, they replaced natural sugars with artificial sweeteners, unnatural flavorings, and preservatives. These things reduce the natural sugar content in foods but they wreak havoc on your metabolism. And we still didn’t lose weight. So, the “experts” told us that we needed to exercise more. What a monumental mistake. The problem is, while exercise may burn calories, it also stimulates hunger. After an intense workout your body will need to replenish the calories it just burned. How does it do that? By sending you signals that you’re hungry and you need to eat! Today, Americans spend billions on diet foods and health club memberships – more than they ever had in the past. And yet, between 1998 and 2008, the number of “clinically” obese Americans grew 37% according to the Centers for Disease Control. We now know fat doesn’t make you fat. Complex carbohydrates and sugar make you fat–especially the highly processed white carbs and the high fructose corn syrup that’s in most processed foods. These are the convenience foods that fill the shelves of our grocery stores. Knowing why we get fat in the first place is the first step towards keeping the weight off. Plan Z takes a completely different approach to weight loss: we work on your body and your brain. I have a really busy schedule. Will Plan Z work for me? Yes. You can do this diet easily at work. We know you have to go to work so we have a Zola to Go! section on our member site with recipes for planning, preparing, and packing meals and snacks that travel well. We can accommodate you even if you are traveling back and forth between two cities as you prepare for your wedding day. We’ve helped pilots, flight attendants, and even traveling salespeople lose weight while on the job. We’ve even helped a company of firefighters lose hundreds of pounds together. Do you travel? Do you go out for meals? We’ll show you how to stay on Plan Z while eating in restaurants. Plus, Plan Z is totally family friendly. Your family can eat the same food you do–they’ll just have different portions because they’re not taking the ZR50 Reduction formula. No need to make your “diet food” and then make “regular” food for your family. Have kids? Kids LOVE the food. You choose what you want to eat every day from Zola’s approved food list. This way Plan Z becomes part of your thinner lifestyle. You can set an example for your children and pass on valuable eating habits to them. We even have recipes for things like healthy chicken nuggets and tiny meatloaves. I’ve tried a lot of diets and none of them worked for me. You are a unique individual, but you are not so unique that the laws of science don’t apply to you. You are not an impossible case. You just had the wrong information until now. We believe if you had the right information you’d act on it and you’d likely be thinner than you are right now. But there is too much misinformation in the diet market place. Here’s why: Kraft makes South Beach Living packaged food, Heinz processes Weight Watchers food, Unilever owns Slim Fast, Kellogg’s owns Kashi Go Lean, Stouffer owns Lean Cuisine, Con-Agra owns Healthy Choice. Their so-called “diet” foods are filled with starch, sugar, artificial flavoring, and high fructose corn syrup. Those ingredients have contributed to America’s obesity epidemic and along with American companies like Coca-Cola and McDonald’s (and many others) they are exporting our obesity epidemic to the rest of the world. Their business plan and packaged foods keep you dieting and buying their foods for the rest of your life. My business plan is to help you break the endless cycle of weight gain and help you move forward into your new life. Obesity is a disease of fat production, not of overeating. If it were a simple math problem of calories in and calories out, we would all be thin. On conventional diets the first ten or twelve pounds come off and then you hit the wall. Your metabolism slows down. You’re hungry and irritable. You tough it out a few more weeks or you quit and the weight comes roaring back. I want to try Plan Z, but I’m worried about my health. Type 2 Diabetes — One Plan Z Insider called us to say he was off his insulin on day four (with his doctor’s blessing!) of his ZReduction phase of Plan Z. He’d been on insulin since 1999! We don’t make medical claims, but many of our dieters report they are making fewer claims against their health insurance. Conventional dieting keeps most of us on a perpetual cycle of losing and gaining the same 13-20 pounds for the rest of our lives. Diet companies win when you don’t lose enough to stop dieting. My plan helps you lose weight and keep it off. When are you going to get to the part where you tell me I have to get on a treadmill for an hour a day or this won’t work? I’m NOT going to tell you that. I’m going to tell you to go walk the dog, or if you don’t have a dog, just chill. NO EXERCISE on ZReduction. Let me be clear. I think exercise is great. I think it’s important. Right now my exercise regimen includes regular yoga and weight lifting. What I will tell you though is we know two things about exercise (even the medical community will agree with me on this). Exercise will make you stronger. It will also make you hungry. While you are on ZReduction, your energy should be put into enjoying the dieting experience. People who are seriously overweight have a difficult time approaching exercise and they take a deep sigh of relief when I tell them they don’t have to exercise to lose weight. You are not going to lose muscle mass. You’re only on ZReduction for 50 days; and if you don’t currently exercise, your lifestyle and routine are just going to remain the same. You ARE, however, going to lose fat. When you get to the ZReboot phase of the diet we are going to recommend you find an exercise program that suits your lifestyle. If you want to tighten up the loose bits left after losing the weight, you’re going to have to exercise to tighten up. Some tightening will occur naturally during a process we call ‘reshaping’ but for the bigger issues, you’ll need a targeted routine. Once you’ve completed ZReduction we recommend non-impact exercise, like yoga, Pilates and weight lifting. Too much emphasis has been made on exercises that tax your joints and your bones. There are plenty of things you can do that don’t wear out your skeleton. And they don’t all require a gym membership. Plan Z dieters who are a little older talk about how fun it is to chase the grandchildren around the park instead of sitting on the park bench watching. They get on a swing with the kids and laugh. They feel like getting exercise now. They might want to take a long walk in the sunshine and even include speeding up their pace so they get a bit of heart benefit in an aerobic mode. Some get heavily into gardening and growing their own veggies. You can take walks in the woods and learn how to forage for wild mushrooms. There’s a lot more to life than your TV screen or your computer. The best part is when you get off a considerable amount of weight you FEEL like exercising. A whole new world of activities opens up. People say their joints don’t hurt as much. You might feel like getting on a bike and tooling around the neighborhood. Or you might feel like a vacation in San Francisco but this time the hills won’t look so daunting. Or join a bowling league. I’m just tossing out ideas, folks. I understand if you’re skeptical. My husband walked out of the room when I told him I was thinking about going on another diet. He was sick of watching me fail on one diet after the other. Now he is on board and has even done Plan Z! Even if you believe Plan Z worked for me and thousands of others, you may have failed on so many diets you just can’t believe it will work for you. I want you to feel completely safe investing in your thinner future. Sign up. Have the manual and ZR50 Crave Control spray delivered to your door. Look it over. Pay close attention to the first ten days where we practically take you by the hand and make sure you get off to a fast start. Get instant access to the Plan Z Works! Members’ website. Look over the recipes and even taste drive a couple. Then, if you don’t think Plan Z is for you, call us. We’ll send you a paid UPS return label and you can send everything back for a full refund. Just return all the bottles of your ZR50 Crave Control spray with their original safety seals unbroken along with your manual. Then follow Plan Z for nine days. Call or e-mail Zola every day to report your progress. We’ll offer you support, coaching, and encouragement. If after nine days, you are not absolutely convinced that Plan Z is everything we said it would be we’ll send you a paid UPS label for you to return the product and unopened bottles of ZR50 Crave Control spray and refund you the full purchase price minus $135. You must return the manual and all bottles of formula to qualify for this refund. Plan Z will have only cost you $15 per day. Even the most skeptical people soon become Plan Z champions. People who have failed on every other diet can’t wait to tell family and friends about the diet that works: Plan Z. To order Plan Z as a skeptic, simply add the Skeptics Option to your cart along with your preferred Plan Z Diet payment option. Ready to get started? Click here.